Although not officially supported or tested, due to the above devices being class compliant, we would expect them to work with an iPad*. In order to connect the interfaces to an iPad you will need an Apple Camera Connection Kit. Please note that you will still need to use the power supply unit that came with your interface, you will not be able to bus-power the interface from the iPad. In order to do this, it is first necessary to set up the routing on the interface by connecting the unit to a Mac or PC with Scarlett Mix Control (for Scarlett 1st generation) or Focusrite Control (for Scarlett 2nd generation and Clarett USB) installed. You can download this software from the Downloads section of our website. You will need to configure Scarlett Mix Control/Focusrite Control and then save those settings to the interface since the settings cannot be altered while the unit is connected to the iPad. Scarlett Mix Control/Focusrite Control dictates which audio signals get routed to each output on the interface. The below steps show you an example of how you may wish to route the audio on your interface. If you wish to use the Direct Monitoring feature of the interface and hear your inputs before they pass through the software on your iPad, you will need to select "Custom Mix" for each physical output you have your speakers or headphones connected to. On the right hand side of Focusrite Control, add the inputs you wish to include in the mix. You will then need to mute (or turn off input monitoring) the tracks that you are recording to in the recording software on your iPad to prevent you from hearing the signal twice (it will still be recording even though it's muted). You can adjust the relative balance of the inputs using the faders in the Focusrite Control software. Lastly, add a stereo channel in the Software Playback section of the window, so that once you have recorded into the iPad, you can unmute the tracks in the software and hear what you have recorded. An example of Direct Monitoring in Focusrite Control with a Clarett 8Pre USB can be seen below. If you wish to hear only the return signal from the recording software (for example if you're using an amp simulator or additional effects), select Playback channels 1-2 for any outputs you have speakers or headphones connected to. This prevents the input signal being sent directly to the outputs, allowing you to monitor from the recording software you're using instead. An example of setting up Focusrite Control to monitor from the software on your iPad is below. If you're connecting a guitar/bass to one of the first two inputs on the interface, you'll need to select the Instrument circuit rather than the Line circuit. This can be accomplished in the Device Settings section of Focusrite Control. 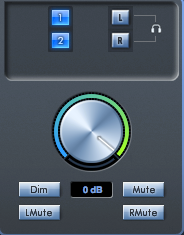 You can change the volume of the outputs by using the faders on the left-hand outputs side of the Output Routing window. The "Monitor Controls" section in the Device Settings tab dictates which outputs the physical main monitor dial is controlling the volume for on some of the larger interfaces. Finally, ensure that the sample rate is set at the desired rate and that your sync source settings are correct (if you're not connecting any additional equipment digitally via ADAT or SPDIF, this should be 'Internal'). After you have finished your configuration, close Focusrite Control and turn off your interface to saves the settings to the interface. You can now connect it to your iPad using a USB cable and the Apple Camera Connection Kit and use it to record and play back audio with a recording app. If you wish to use the low latency input monitoring feature of the Scarlett interfaces and hear your inputs before they pass through the software on your iPad, select Routing Preset 'Zero Latency Tracking'. You will then need to mute the tracks that you are recording to in the recording software on your iPad to prevent you from hearing the signal twice (it will still be recording even though it's muted). You can adjust the relative balance of the inputs using the faders along the top of the screen. If you wish to hear only the return signal from the recording software (for example if you're using an amp simulator or additional effects), select Routing Preset 'DAW Tracking'. This prevents the input signal being sent directly to the outputs, allowing you to monitor from the recording software you're using instead. If you're connecting a guitar/bass to one of the first two inputs on the interface, you'll need to select the Instrument circuit rather than the Line circuit. This can be accomplished at the bottom of Scarlett Mix Control (or on the front panel of the 18i20). On the right hand side of Scarlett Mix Control is the Monitoring section. In this section, it's possible to dictate the level being sent to each output on the interface. If an output is blue, it's volume is affected by the position of the software volume dial. If red, that output is off and no signal will pass from it. You can turn outputs blue/red by left-clicking on them. Shift-clicking will turn an output grey. This means that the output is not affected by the position of the volume dial and will output at full scale (maximum volume). This is useful if you wish to control, for example, the volume of the headphone outputs using the controls on the interface itself. After you have finished your configuration, go to File > Save to Hardware. This saves the settings to the Scarlett interface. Now, close Scarlett Mix Control and disconnect the Scarlett interface from the computer. You can now connect it to your iPad using an Apple Camera Connection Kit and use it to record and play back audio with a recording app. * Please note, as we only support the use of these interfaces with Mac and PC computers, we may not be able to offer Technical Support if the interface is not working with an iPad for any reason.